NitroFlare is one of the best in the industry and describes itself as the best and fastest service for uploading, storing and securely sharing data on the Internet. The Filehoster offers an international service for transferring, storing, backing up and distributing data. NitroFlare explains on the homepage that server speed is almost unlimited and that there are no comparable services that offer the same level of quality. The provider naturally refers to the NitroFlare Premium Service, which is provided against payment. NitroFlare allows you to upload various files up to 10 GB per download via browser upload, remote upload or FTP to the provider’s servers with a free account. In addition to the free account, you have a total of five paid subscriptions to a NitroFlare Premium Account, allowing you to enjoy the full range of NitroFlare services. NitroFlare Premium offers a 2-day trial and rates for 30 days, 90 days, 180 days and 365 days. The trial 2-day subscription is only slightly cheaper than the 30-day tariff, which quickly takes the visitor to the 30-day subscription for NitroFlare Premium. NitroFlare offers not only the ability to upload and download files, but also an attractive way to make money and promote the service. Depending on the account type, you may receive a commission of up to 10% if the provider benefits from new customers through you. The payment options for the NitroFlare Premium Account include the well-known credit card methods. VISA, MasterCard, American Express and Discover Card are all accepted. 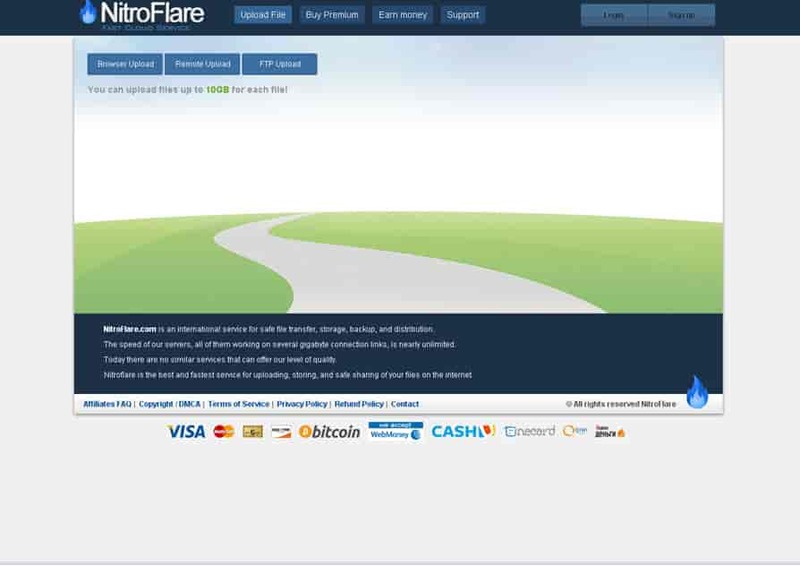 Other methods, such as WebMoney are also available for the payment of NitroFlare Premium. If you want to pay anonymously, you can do so via Bitcoin. Privacy and data protection are becoming increasingly important to many consumers. With regard to the protection of your personal data and your privacy, you can rely on the reliability of NitroFlare. Personal financial data is not stored by NitroFlare, as the payment process includes separate payment services that process the data. The customer service link can be found at the top of the website under the “Support” tab. The user will be asked to search for a solution first in the question and answer box at the top of the target page. Below you will find a contact form, where the e-mail address, the subject matter and a concretization of the application are required. The captcha can then be confirmed and the message sent. The online presence nitroflare.com is clearly structured, so you can view everything that is important at a glance on the homepage. Even without an account, you can upload files up to 10GB with Browser Upload, FTP Upload, or Remote Upload. In addition, you will find the subpages “Purchase premium”, “Earn money” and “Support” at the top of the page. By clicking on “User” in the top right corner of the page you will get to the account overview. Here you can see, among other things, the available storage capacity, the account balance and information about the earning options. You can also find statistics on clicks, downloads and sales. From here you can go to the “My files” tab, where you can practically organize and view your files. It is also possible to open the affiliate reports and create an FTP account. You can also view your individual uploads and sales references and find links to two developer APIs. With a NitroFlare Premium Account, you can use the maximum speed when you visit NitroFlare.com. In addition, you benefit from the possibility of not only downloading the desired videos, but also of viewing them online. 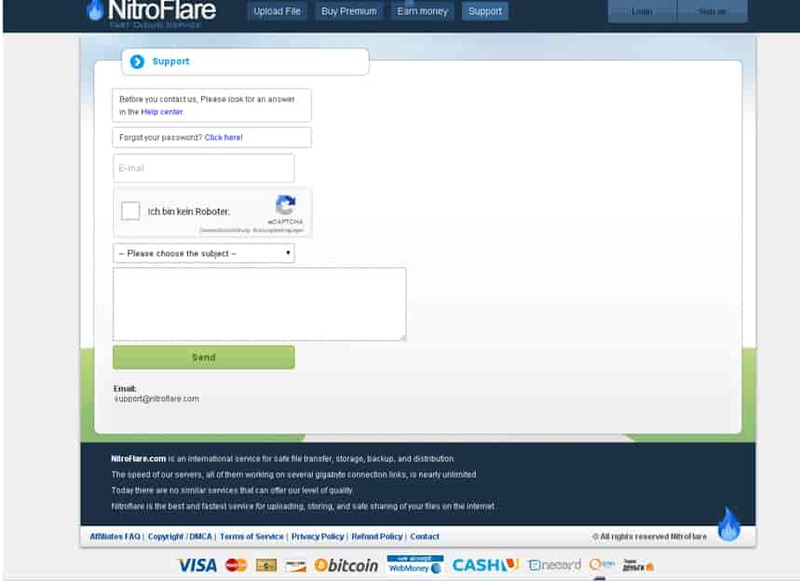 In addition, you will not be disturbed by any advertising while using the service and you will benefit from NitroFlare Premium via priority customer service. All in all, NitroFlare offers an interesting range of products that can be used both free of charge and for a fee. With the NitroFlare Premium Account, you have all the options and can use the maximum speed, but the size of the free account is limited. The page is clearly structured so that all information and functions can be found quickly. Try the free NitroFlare offer for yourself and upgrade to NitroFlare Premium if you like it.